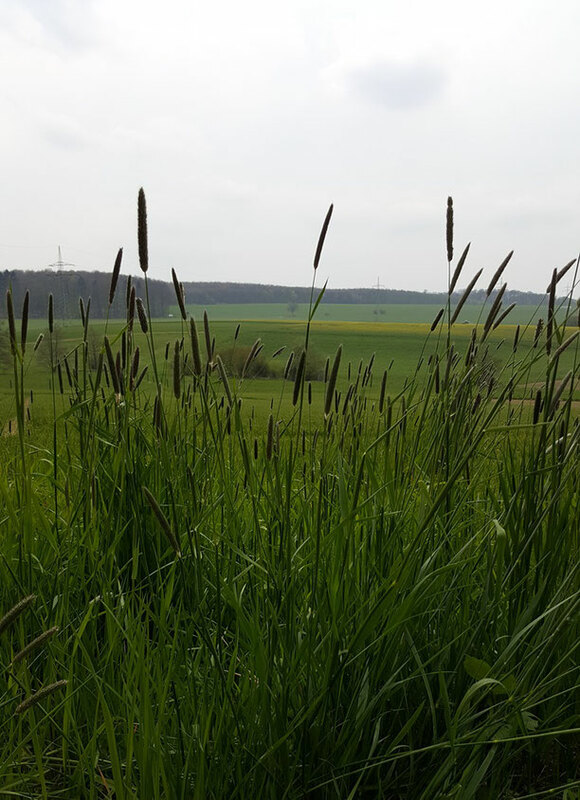 This and that - monemades Webseite! 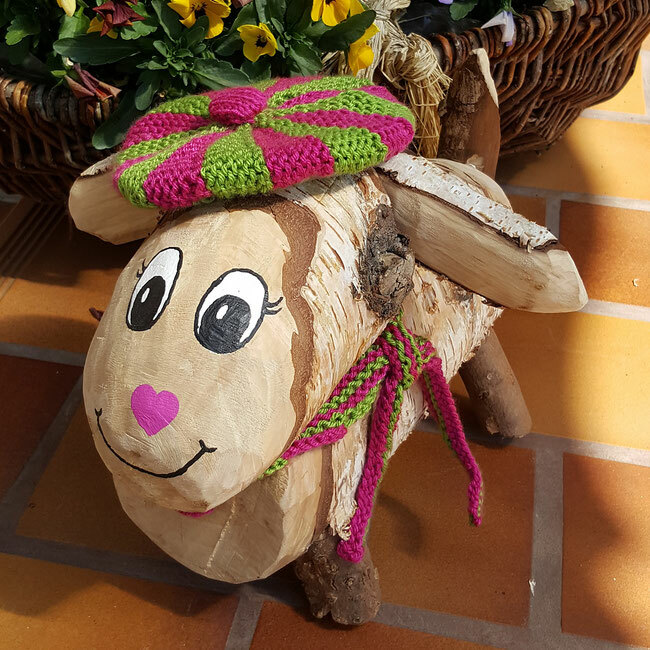 Finished the hat for this cutie only this morning in the nick of time and now our gift for my mum is already enjoying the wonderful weather we are having this easter: Heli, the Easter Lamb. Why is she called Heli, you ask? Well, when DH first showed me what he made, her ears made me laugh so hard and I said she looks more like a helicopter than a sheep... so Heli she was named right away. ;-) Now that she is completed, I think our joint project turned out great and my mum sure loves her. 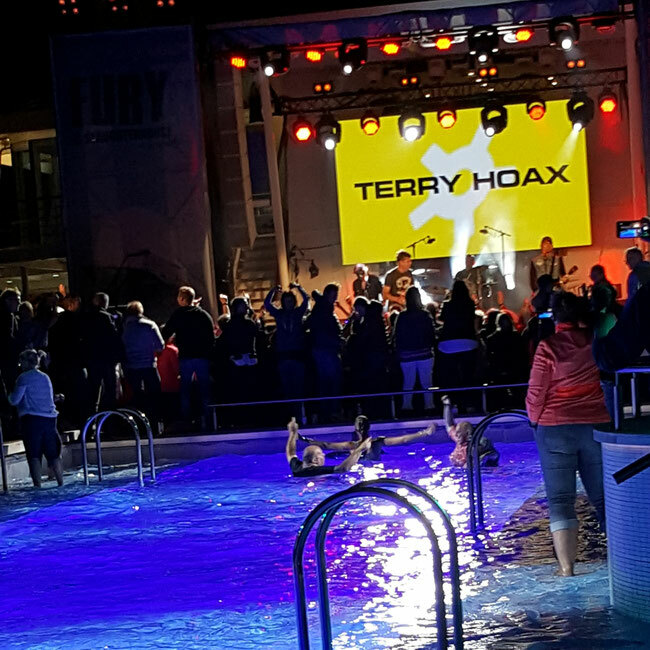 So there we were, alsways saying that a cruise is nothing we would enjoy - but we threw our prejudices over board (so to speak), the moment we saw that a local band - Fury in the Slaughterhouse - would organize a short event cruise with loads of music... So last weekend off we went and boy, we had a blast! But then, even with all the music I do have this craving for yarn - and fortunately we had a stop in Amsterdam and I got to visit a shop I had hoped to go to for a long time: Stephen & Penelope. ... at least I think that's what I'm suffering from when I look at the rocking chair in our kitchen. So there I am, as always with the best intention to have my x-mas surprises sent to my friends abroad early, and as always it is once again a matter of luck whether my packages arrive on time. It's not even an excuse that I had to finish some handmades, is it? I definitely should work on my time management, however, I am so happy I finished these. Busy, busy, busy with deadline knitting... Why do all my commissions always seems to be due at the same time? Ah well, I am glad that so many of my patterns will appear in some magazine or the other next year! Anyway, after a couple of hours of knitting my shoulder usually tells me I should do something else and this time I listened and worked on a small x-mas gift. ... and not make myself a gift even though it is DH's birthday today, when there's such a wonderful new book? 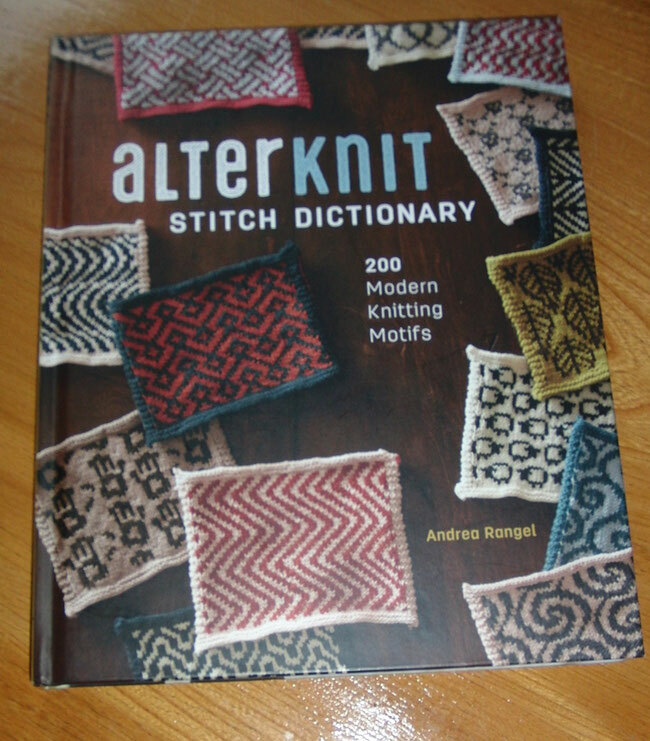 Okay, it was a conincidence it arrived today, but it was fun nevertheless and I am so thrilled about this stitch dictonary. Lots and lots of beautiful and unique colourwork design and my head was spinning with idea when browsing threw it for the first time. But enough ranting, so there I was, considering ideas and I really think I should knit some more garments. I don't do that very often and I think what puts me off is not only the darn seaming when all pieces are done, but also that there's usually a bit of math to do. Even with a well written pattern and the same yarn used for the sample, I get myself into gauge issues and/or need to adjust the pattern to fit my long arms and what not. 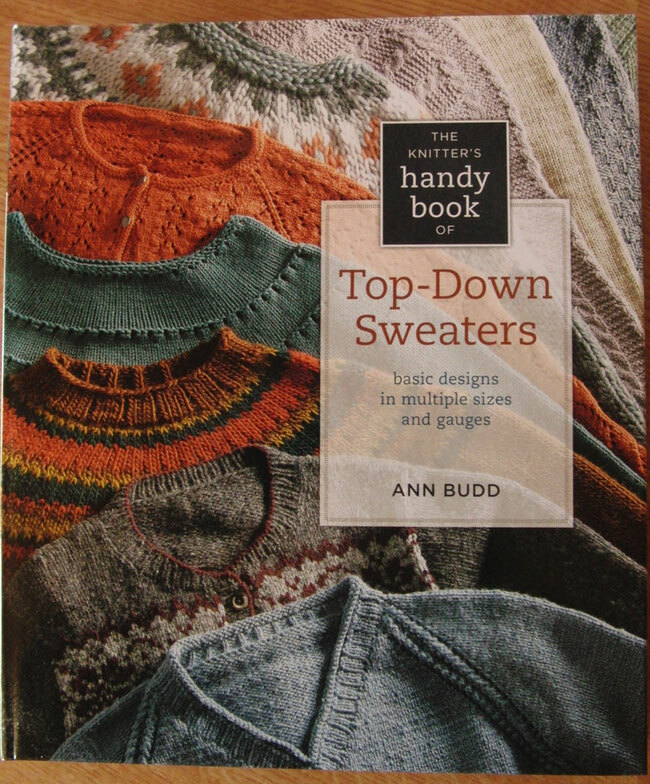 Ann Budd's Top-Down Sweaters! Four basic sweater types are explained and a couple of patterns are given for each. They come in lots of sizes and for each all the numbers for different gauges are calculated. It doesn't get any better, even though at first sight it looks a bit intimidating, don't you think? 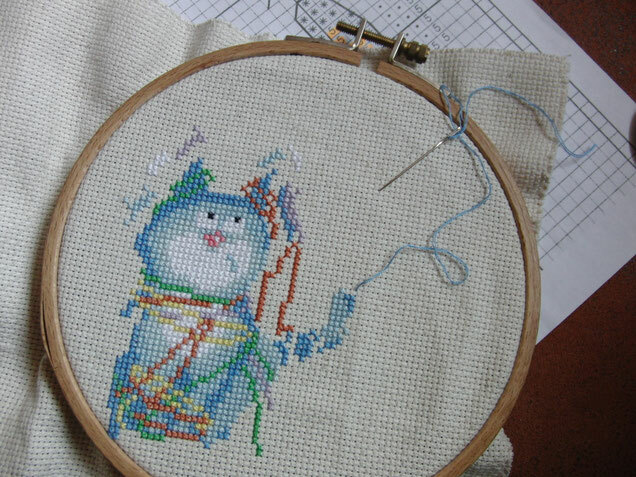 ... how much I like counted cross stitch. But when decluttering the attic I came across this project and couldn't restist to start right away. :) Or maybe, I do admit it might have be a reason, it was a great way to get away from cleaning up the attic...tee-hee. Anyway, I've enjoyed it and I'm sure I'll love it when it'll be finished. I've got to admit that all the grey and rain is really getting on my nerves and apparently my motivation doesn't like the weather either and has moved to some sunnier place. 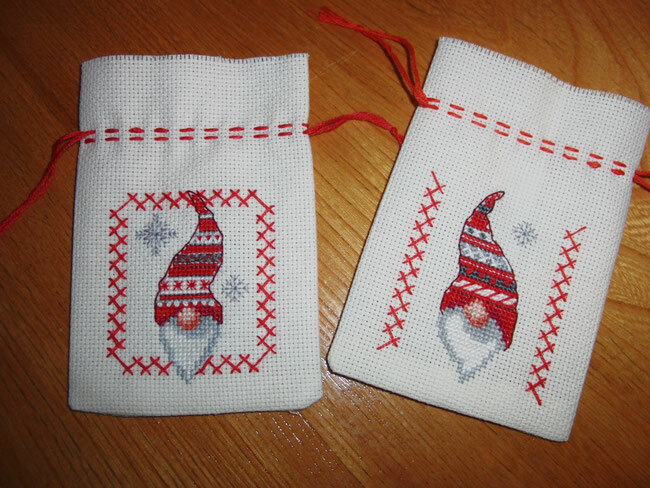 Not much to tell about my crafts, since all I seem to have worked on for nearly a week were swatches for new design ideas and a couple of x-mas ornaments for our ornament exchange. My creativity clearly has been in hibernation. 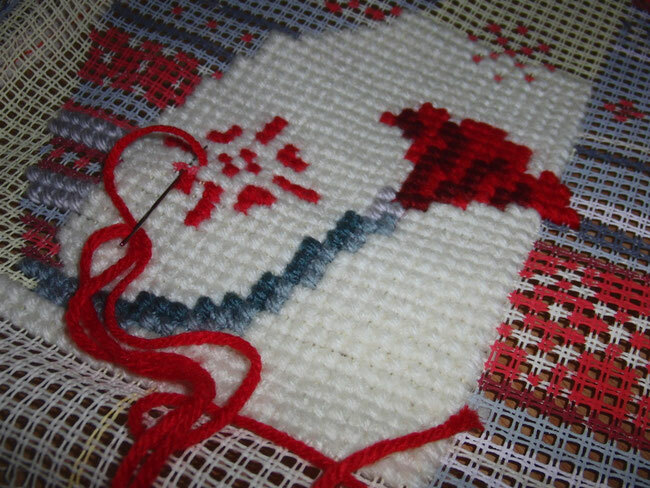 I'm using the Addi Sock Wonder needles for this; we'll see if with an easier pattern I like it better to work with them. At the moment I still feel pretty clumsy with this tiny circular needle. Oh, and even though I usually don't like to knit the same pattern more than once, I decided to go with the pattern of the 'original socks'. It's called 'Bremen Muster' by Kristin Benecken (free on Ravelry); it's fun and easy to knit and goes so well with a striping yarn. Those who read along probably know that this time of the year is my least favourte season at all: grey, dull, rainy, ugh... I could easily live without the German winter and I admit that seeing the same sh.. every single day is a bit depressing. So hooray for this wonderful idea to brighten each day in February: the Yarn Love Challenge. 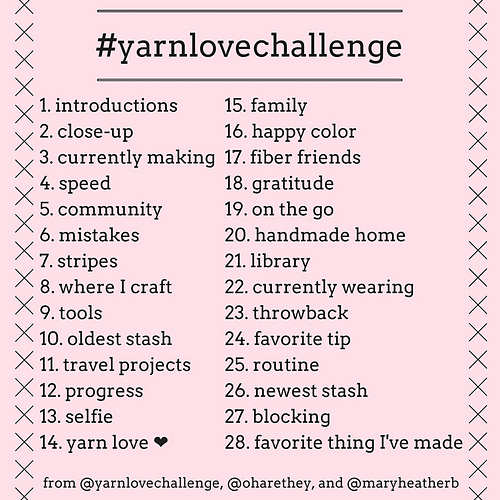 The idea is simple: participants post each day a yarny, fibery, craft-related picture based on the list of themes below with the hashtag #yarnlovechallenge on Instagram. And even though it's only the third day, I can tell you that the challenge is the perfect cure for my winter blues. So, so many wonderful pictures to look at! 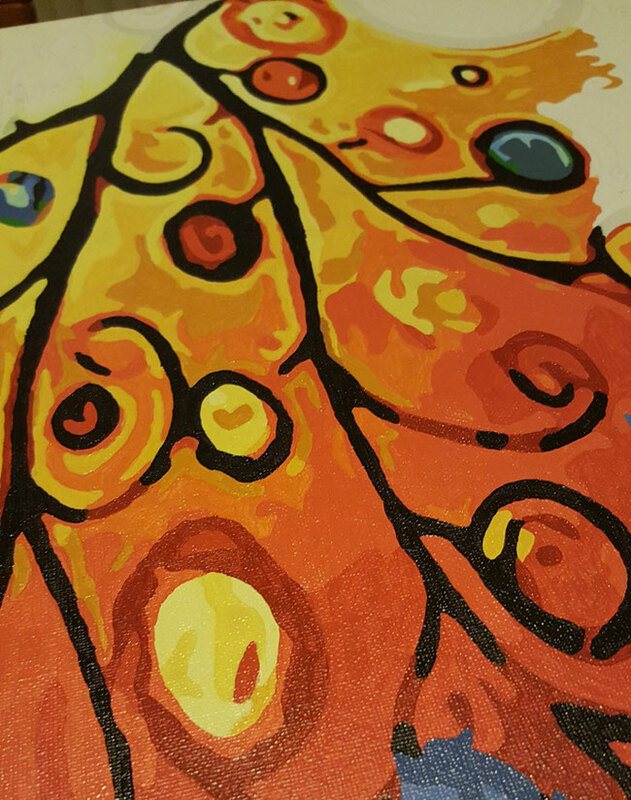 If you are on Instagram, don't miss out, it's fun! In the last couple of years it became kind of a 'tradition' to visit the Handmade exhibition in Bielefeld, a town about an hour away from where we live. 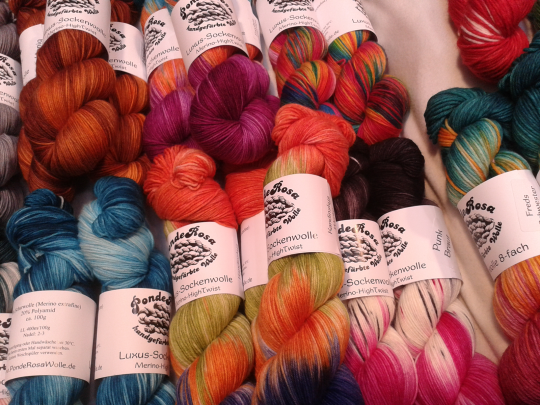 It's an exhibition for all kinds of crafts, so not exactely the perfect one for a yarnlover, but then, what better way is there to fight the winter blues than looking at beautiful handcrafted stuff and colourful supplies? 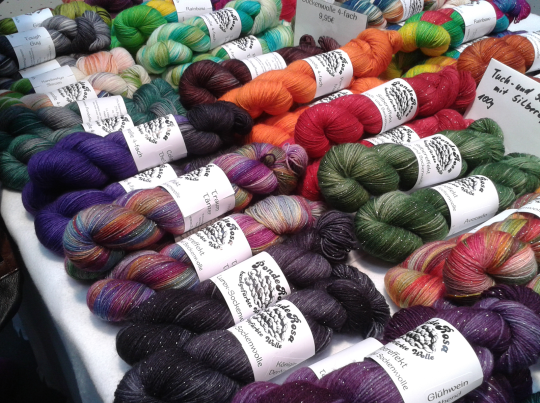 And of course, there are a few stalls selling yarn... Wanna walk around with me? The exhibition takes place in Bielefeld's municipal hall and it's actually two seperate halls, connected by a gallery. 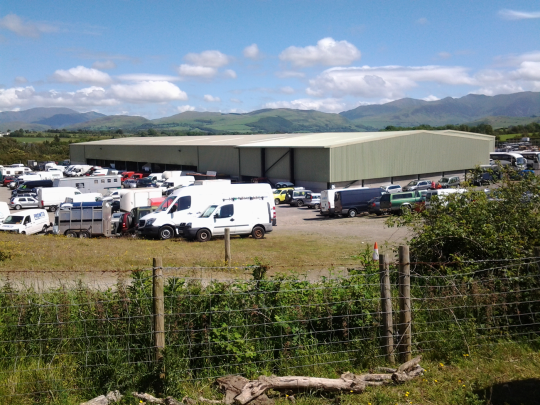 Here's a few into the main hall with all the stalls. Luckily it isn't as crowded as it was in past years in this picture, so you can see one reason I love to go there again and again right in front: Ponderosa Yarns. Really one of my favourite German indie dyers. After procrastinating literally for years, I finally tackled the task to add new lights to the wooden Christmas tree decoration I made years ago. 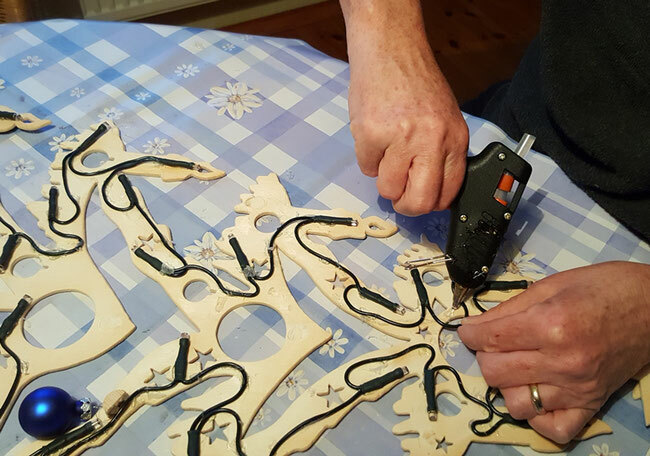 There went so much work into sawing the pieces and attaching the decoration, and it was such a pity we didn't use it anymore, only because some lights were broken. 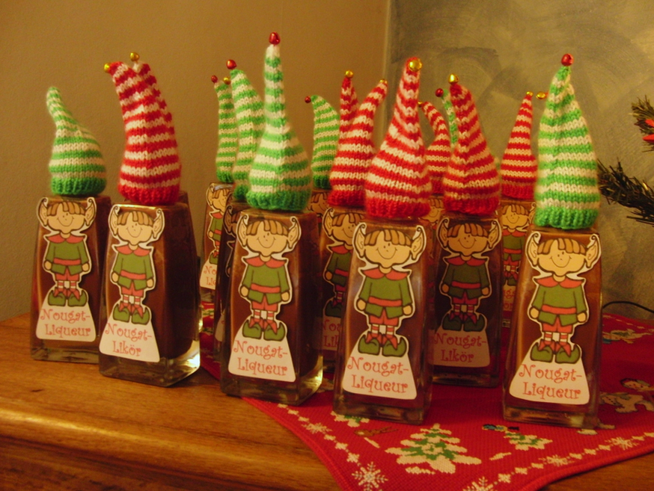 Hopefully everyone who receives a bottle will like our treat and enjoy it as much as we enjoyed preparing them. 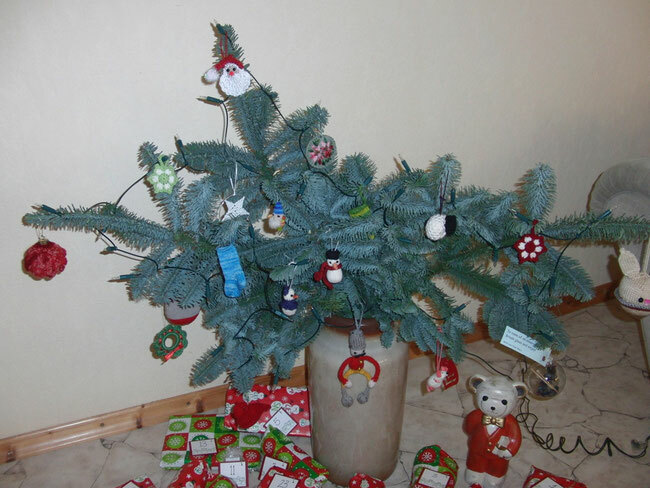 I don't go wild with Christmas decoration, but there are always a few selected things around the house to get us into the right Christmas spirit. Usually I put them up in the week before the first Advent Sunday and this year was no exception, so that's what my limited time for stuff was spent with in the past few days. My favourite decoration are these fir branches in our hall. Not only do I like the scent of the fir branches, but these are used for handmade ornaments I received from my friends all over the world. ... and gave them a bit of resh paint. I don't think the birds will even realize, but I love their cheerful look. It is probably not a big surprise, that I love knitting books just as much as yanrn, especially the ones about knitting history, techniques, stitch pattern. 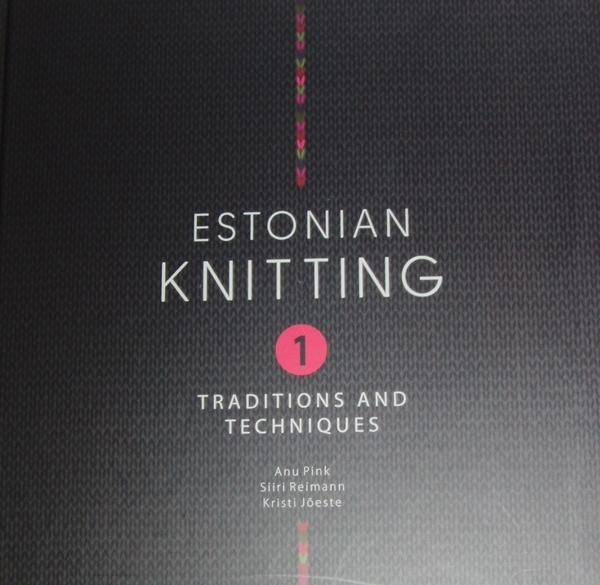 So when I read in a newsletter about Estonian Knitting, Traditions and Techniques by Anu Pink, Siiri Reimann and Kristi Joeste, I knew it'll find its way on my bookshelf eventually. And a short while back I finally ordered my copy in Estonia... and boy, was in in for a treat. The first part of the book covers the rich knitting history of Estonia, complete with lots of pictures of samples from different times and information about regional differences. Quite a while since I last wrote a post, but those of you who follow me on Instagram will know that we were away on holidays. 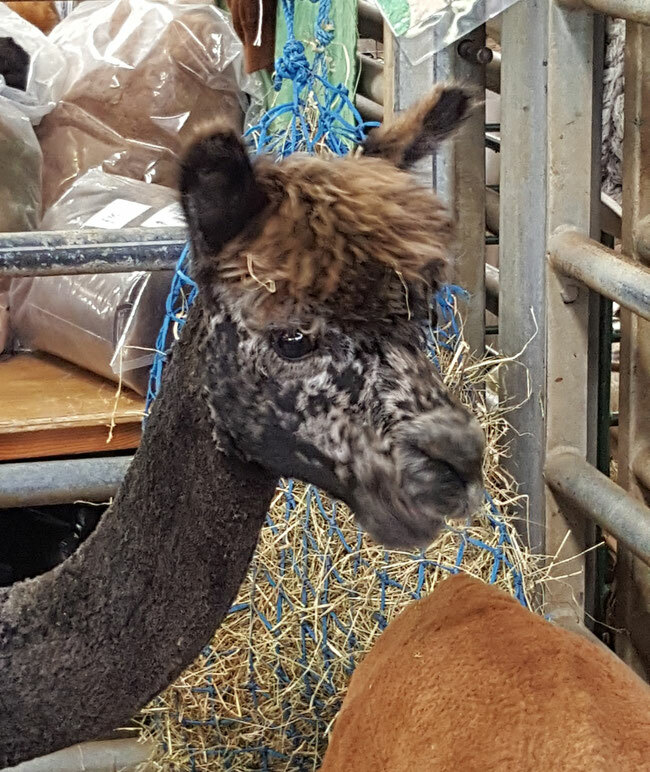 We had a great time travelling the northeast of the USA and I guess it comes as no surprise that this trip was planned around one of the fibre festivals I always wanted to visit: The New York State Sheep and Wool Festival in Rhinebeck. 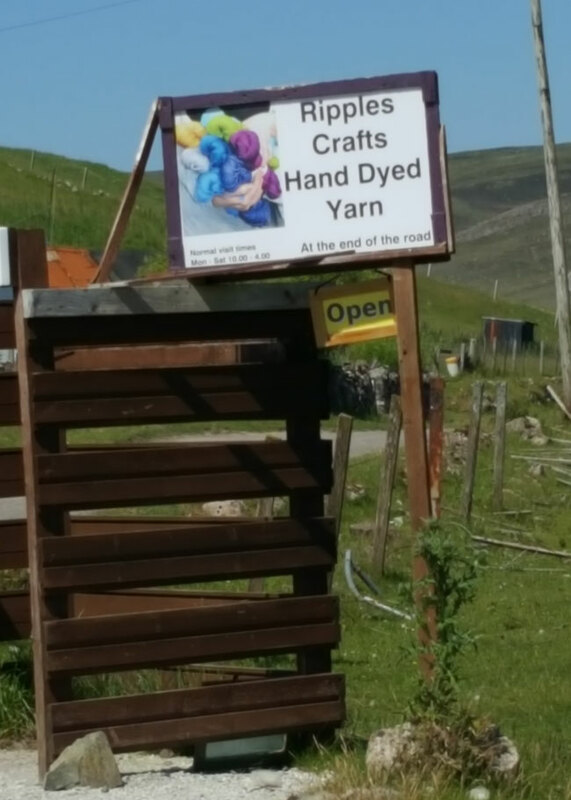 I guess it's well known by now that I've got a yarn stash that could almost compete with a small yarn store, but I have to admit, yarn isn't the only thing I can't say 'no' to. 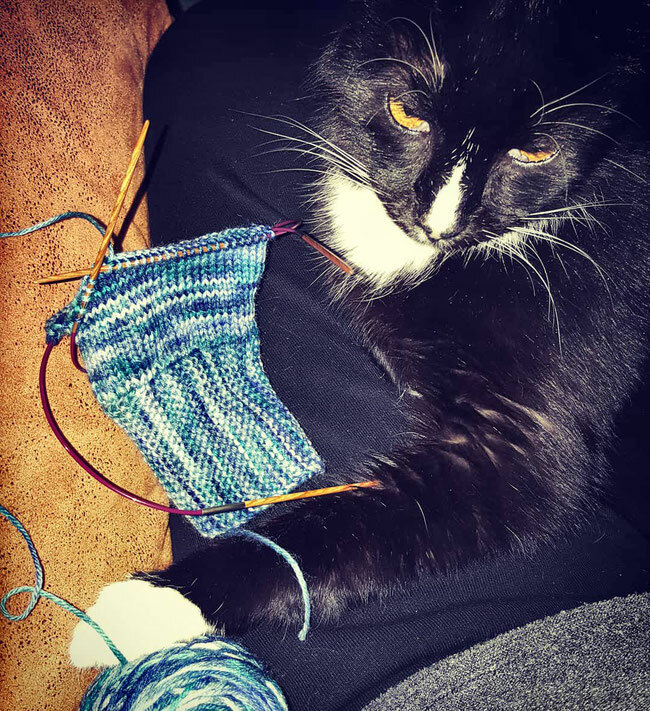 Whenever there are new knitting needles available, I can't wait to get my hands on them. No matter if metall, wood, bamboo, no matter if round or square or with stiletto tips - I've got to try them at least once. 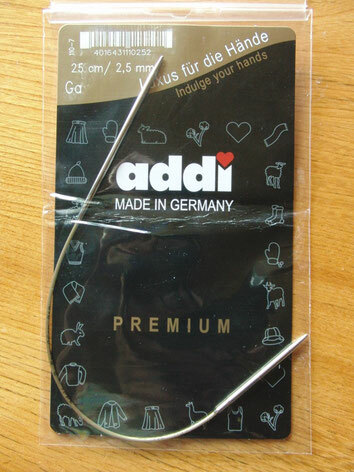 So when I heard about Addi's circular needles called 'Sock Wonder', I had to order them right away. We've spent the past few days cleaning up the attic above our garage and I can't even tell you about all the dust and spiderwebs we had to deal with. 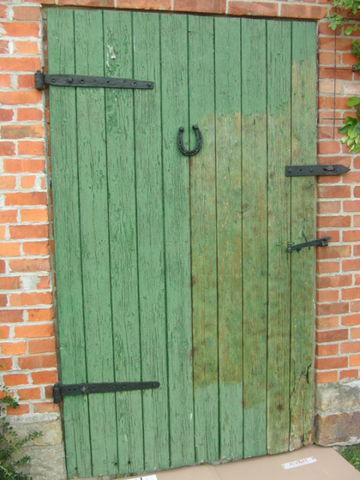 Ages ago, when this house was a farm house, the attic was used to store corn, but in the past 40 to 50 years or so, it became the place to store 'stuff one might need one day'. So there's a lot of garbage, but also some interesting findings. Like this antique swift. There are some small bits missing and the base had an encounter with wood worms, but it still works. I really think it's a great piece of craftsmanship. 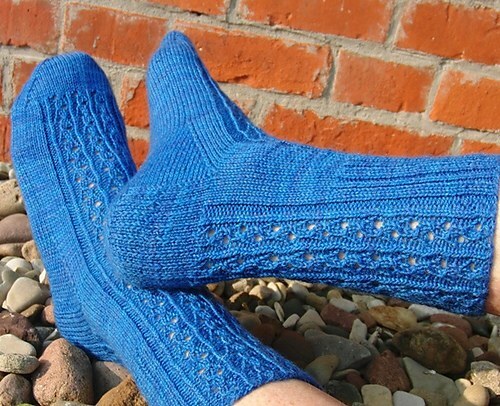 In one of the groups on Ravelry I'm in, we've run a round of 'travelling socks'. 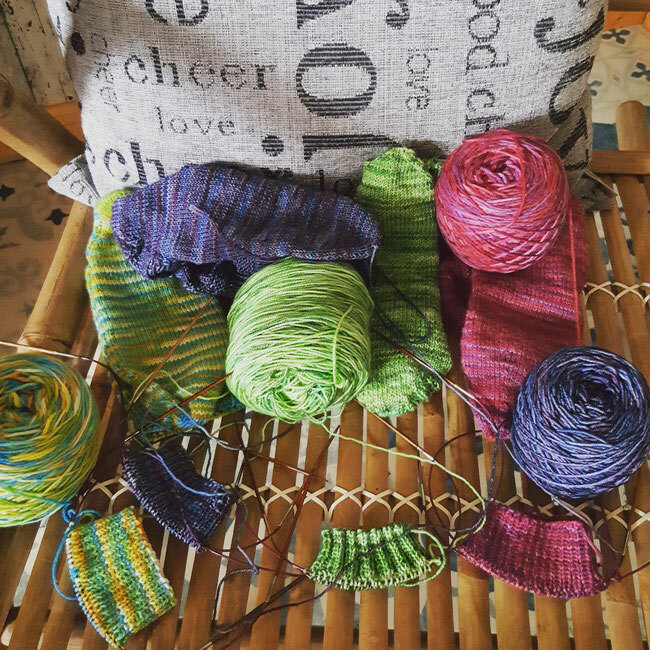 The idea is, that each participant starts a pair of socks, finishes the cuff and then sends the WiP on to a friend in the group. The socks travel from knitter to knitter, whoever wants to participate adds a bit, and once the socks are finished they are returned to the sock owner. The 'sock owner' provides all details like sizes and construction preferences and also chooses the colours for their socks. 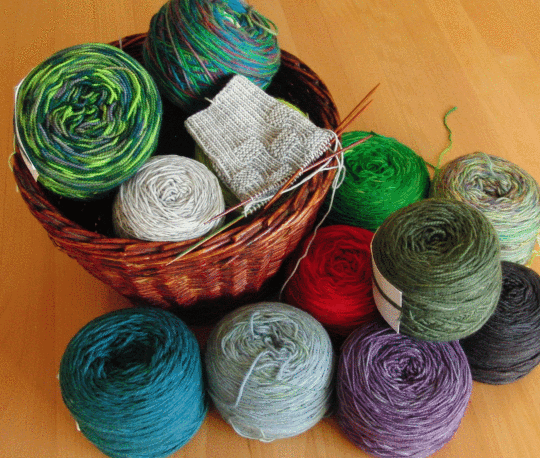 It is al ways a fun activity and its fab to see how many beautiful pairs of sock are knit. Since it's only an inch or so everyone adds, it's a project even folks with little knitting time can participate in. My socks started their journey end of January and I wished for them colours that make you think of faded jeans or the sea on a dull day. Today they cambe back home - and I LOVE them! So me! Many, many thanks to my friends all over the world who knit on them - these will be treasured! 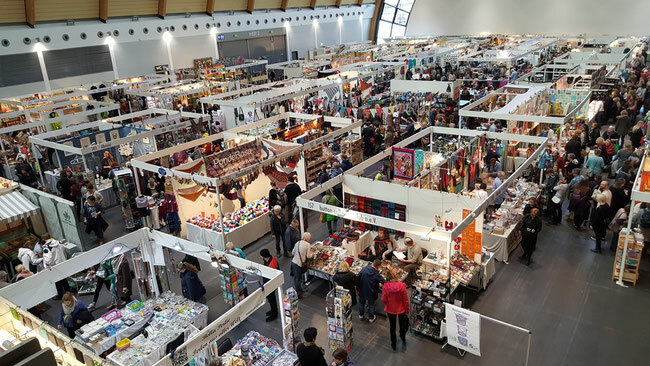 Last weekend I've visited the H&H cologne, a German B2B trade fair for creative handicraft and hobby supplies and it's hard to find words to describe all the inspiring things I've seen and experienced. 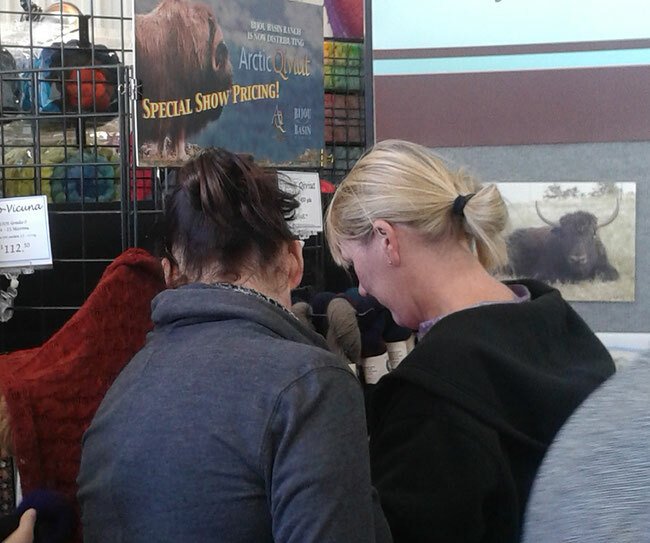 All the well-known brands presented their ranges and had awesome samples displayed, there were lots of indie dyers and I thoroughly enjoyed seeing some yarns I'd only known thanks to the internet and I enjoyed having a chat with the representatives from abroad. I started my day off by competing in the 'The German Quick Knit Championship', but even though I think I'm pretty quick, I am not anywhere near to what some people manage to knit within a minute. 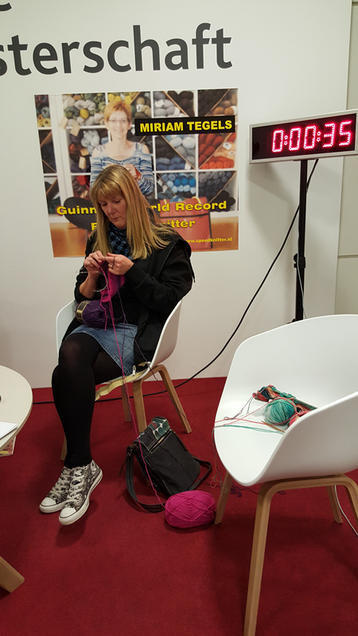 But the event was held by Miriam Tegels who is in the Guiness Book of World Records as world's fastest knitter. 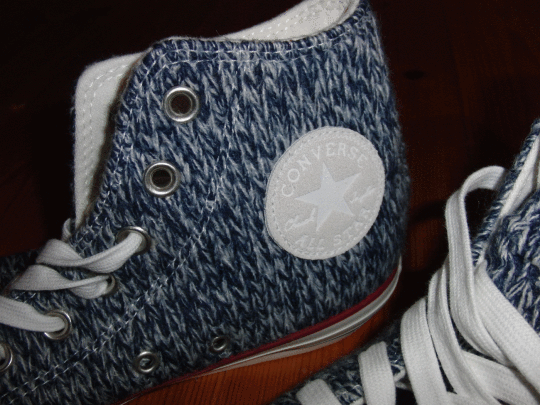 118 stitches in a minute... at that rate I'd whip up a pair of socks in a day. I manage 168 stitche... but in 3 minutes... ;-) Anyway, it was good fun and for a good cause in addition, because all the squares knit are turned into blankets that go to charity. I’m sorry I’ve neglected you a while, but this always seems to be the busiest time of the year. Lots of work, lots of social appointments and hardly any time for any ‘crafting adventures’. 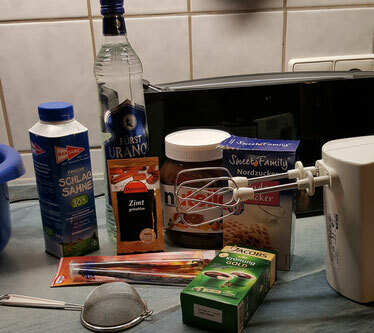 At least Ulli and I found the time last weekend to prepare our traditional gift for our friends: Nougat liqueur. Mm. Yummy. You know we had to try to make sure our friends will love it, right? Oh, and there is something else I finished. 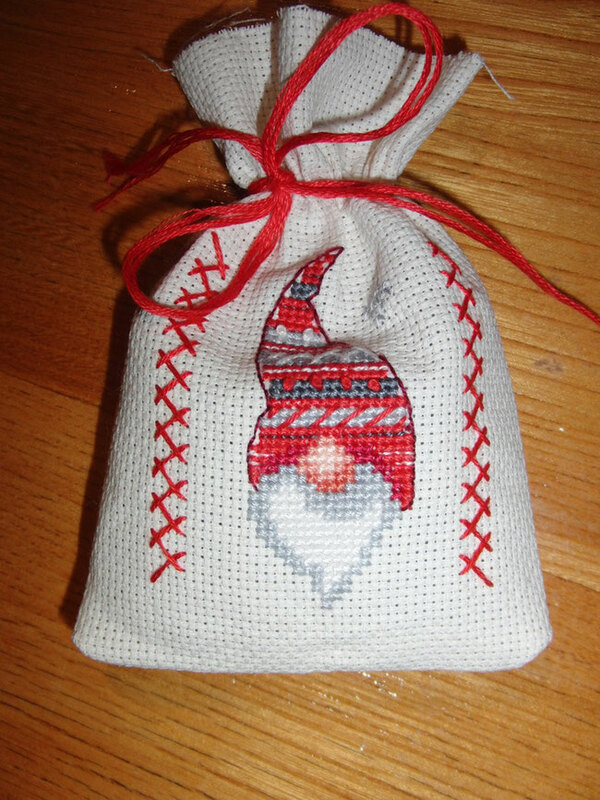 I am still not sure the hook and I will ever be good friends, but at least we got along well enough to finish the Santa Gonk I started a while ago (pattern by Ling Ryan available on the Ravelry website – here). There are bits I should work on improving, but I think it turned out quite nice. And it is already travelling to its new home – hope the recipient will like it. 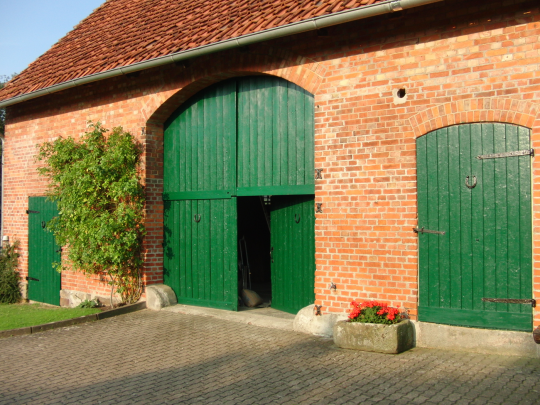 Okay, they don’t look exactly as good as new as I said they would, but they do look as good as doors that are more than 50 years old can look. 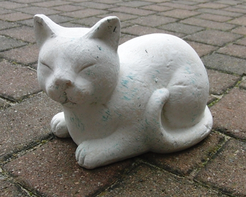 No idea how old they really are, because they were already there and weathered and worn when I was a kid. Anyway, happy I’m done with that job. My knitting time was limited thanks to the doors, but I did finish something nevertheless and it’s actually something I was about to frog. 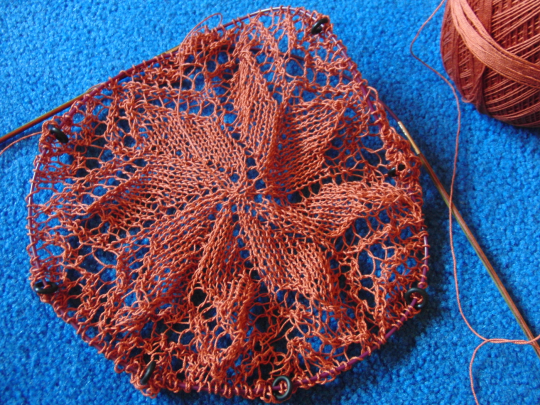 When I was searching for a 2.25 mm needle the other day I remembered that there’s one in use for the doily, one of my ‘I can’t remember when I started this’ WIPs and I was just about to pull it out when Ulli said: You want to rip that out? Really? The colour is pretty. And well, he’s right. 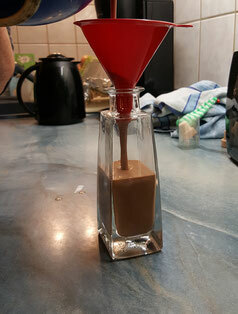 So I put the project on our kitchen table for an occasional round with my morning coffee and funnily enough I even enjoyed it. The crochet cast off not so much and we won’t talk about blocking the thing… but it’s done. And looks quite nice. Love the feeling of accomplishment. 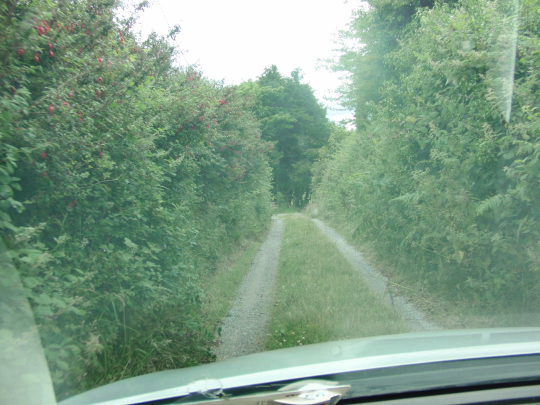 Now, this summer we went to visit them in Ireland and we had hardly arrived when we were told that we would go on a trip.Can you guess where this car is heading to? and I learnt that my way of knitting socks is perfect for me. 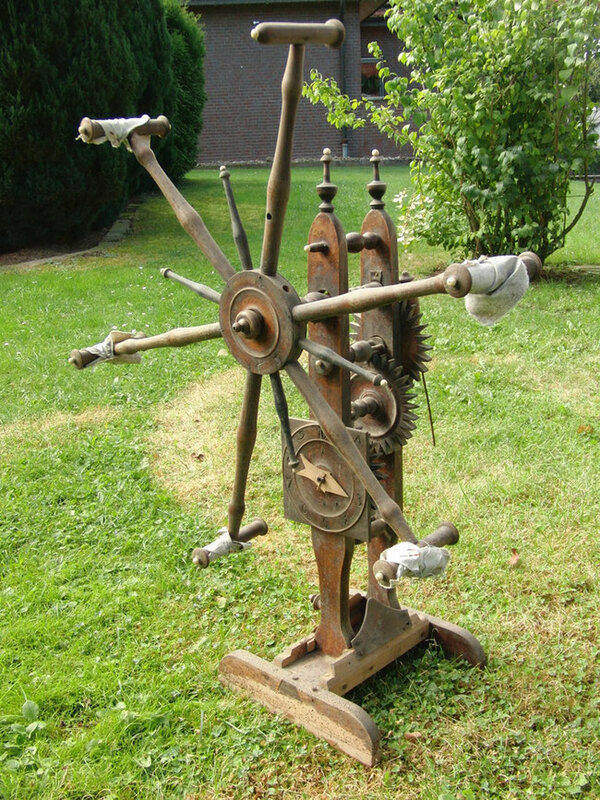 Much easier to knit with DPNs than to learn how to manage this sock knitting machine, lol. So, last night I finished a cabled sock and Ulli told me right away that he wanted to have them. 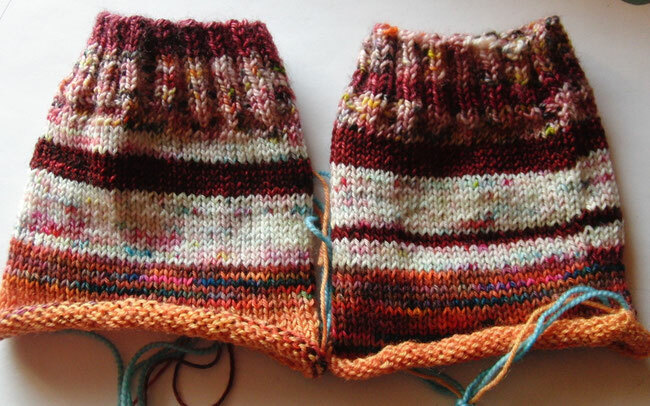 Well, as I said, I finished one sock, so when I told him that it might take a while to finish the second one, he just laughed and said something like: I know. I’m still waiting for the other cabled pair, the green ones. Green ones? Hm?? 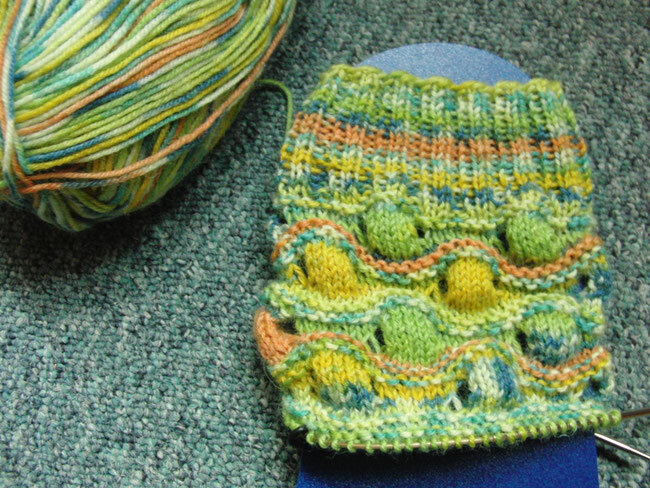 Thinking about it really hard I had a vague recollection of socks knit in green tweed yarn I started during our holidays… in April? Or last year October? Anyhow, they had to be somewhere and I took the fatal decision to look for them in my huge WIP basket. And I guess you now know why the subject today is: How many is too many? You get what you wish for. :) We've had a terrific weekend, with lots of sunshine and warm temperatures. Thank you, summer, I hope you are here to stay. We've spent most of the weekend outdoors, busy with the things that need to be done around the house or just relaxing, so there wasn't much creativity involved, but there's certainly a lot of inspiration these days. 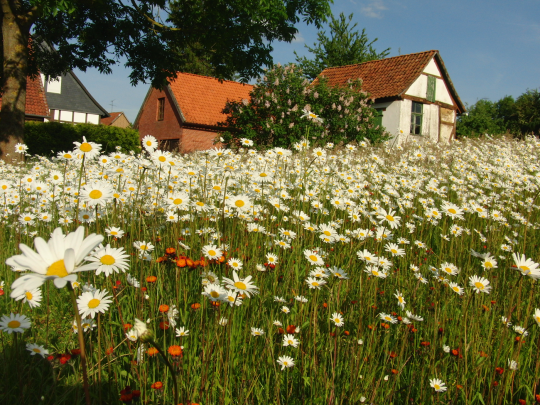 It just makes me happy and gives me ideas to see our meadow in early summer! … and my guess is that I won’t get any knitting done in the next few days since all of these have to find a new home around the house. 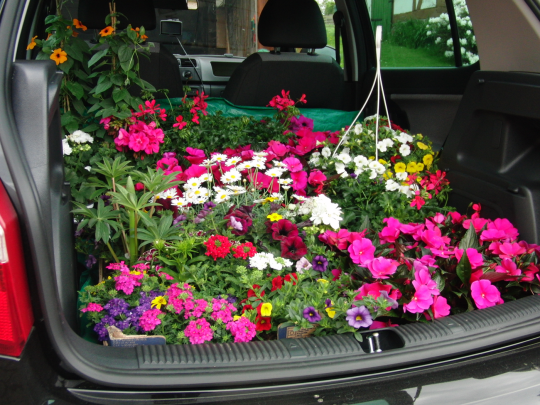 Isn’t it amazing how much you can fit into a small car when you are determined to do so? That’s quite a burst of colours, isn’t it? 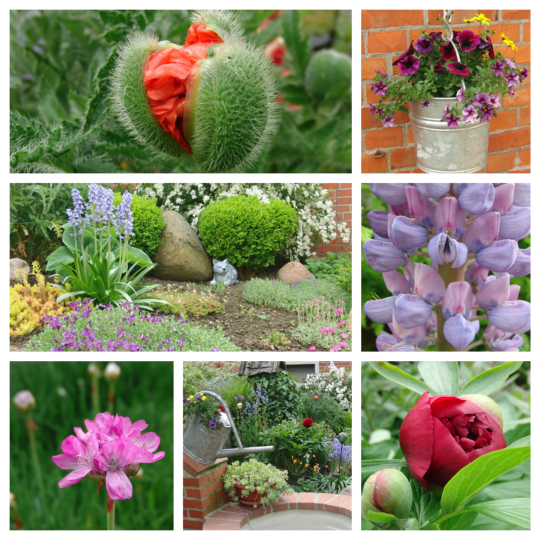 Hopefully our summer will be nice enough for us to fully enjoy our sea of flowers. Well, I know it has been a while since I last shared something with you - but apparently in spring there isn't much time to come up with something worth sharing. Whenever the German weather allowed I spent my days outdoors and started with some of the garden stuff that spring calls for and my knitting time was dedicated to projects I can't share, at least not yet. But it won't be long, I promise. Now we are on a short Easter holiday for a couple of days and well, it looks that my knitting mojo hasn't made it here because all I managed so far is half a sock... How about I show you the lovely socks Glen from New Zealand knit for me and that I took with me to keep my feet warm on still cool Canarian evenings? Stunning, aren't they? Glen knit them from yarn I sent her for our 'Knit my Yarn' Challenge and she had the socks done in no time! I love them and they fit like a glove. 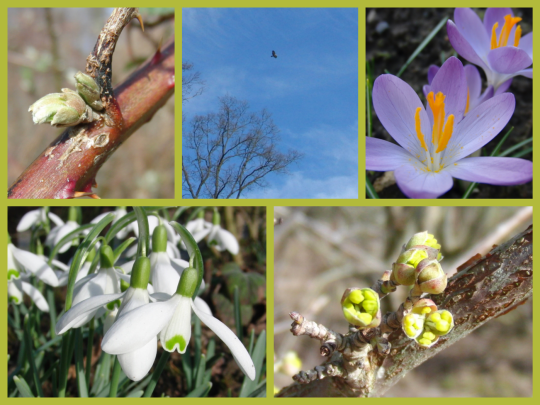 Nature is awakening - spring has arrived in Germany! Let's hope it's here to stay and not just for a visit before winter decides to come back another time. Puts me in a happy mood when there's blue sky, sun, milder temperatures and colours other than all that winter grey! It's my turn tomorrow, February 19th. Today I should rename my blog, since what I'd like to share with you wasn't made by me, but by my wonderful DH. Well, most of it at least, he just needed a bit of help with the finishing touch (and I admit I wasn't really good at that either). 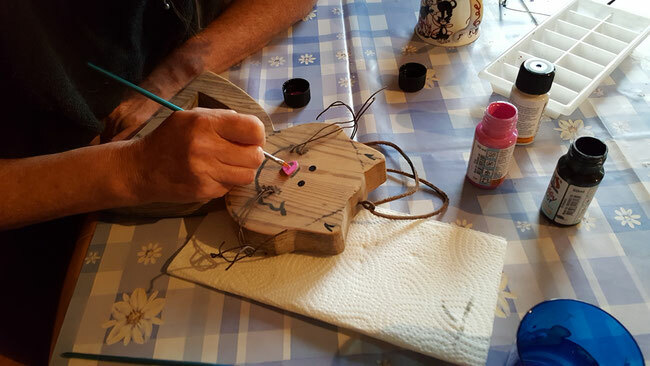 DH loves to do woodwork but he often complains that he has to go into his studio to work with wood and that he'd love to have a hobby he could engage in in the evening when we are in our living room. Just like I do almost every evening with my knitting. So when we browsed through a catalogue with craft supplies last year and he pointed to a carpet and said something like 'I could do something like that too. I think it's fun. ', I immediately took action... and bought him a kit for his birthday. Yep, it got me a startled 'Really?' but when the first amaze was over, he got hooked right away. And he worked on it almost every night. 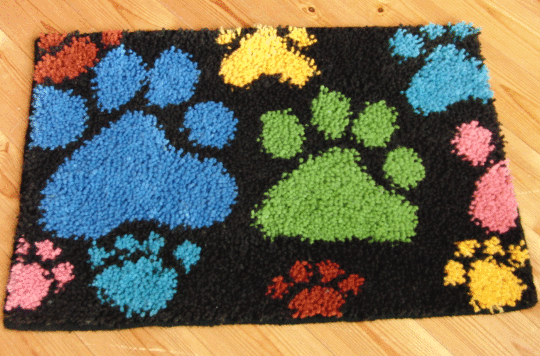 It's a doormat, about 70 x 45 cm and I love the motif and the colours. And I'm so happy that Ulli is so happy with his work. Now to find the perfect place in our house for this wonderful handmade. 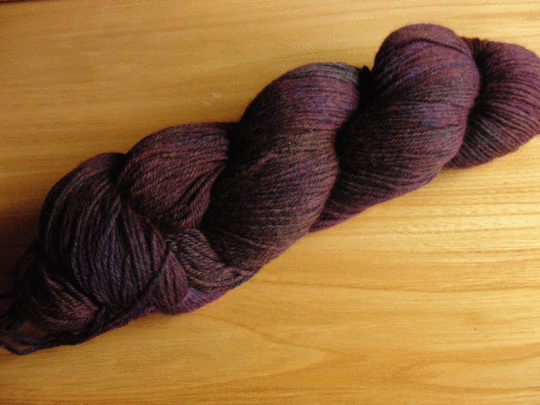 One of my favourite indie dyers from the UK is Posh Yarn. I just love the stunning colours Tony creates every single week with his dyes and Dee's fanciful names for the colourways have put a smile to my face very often - and one needs to love things that make you happy, right? 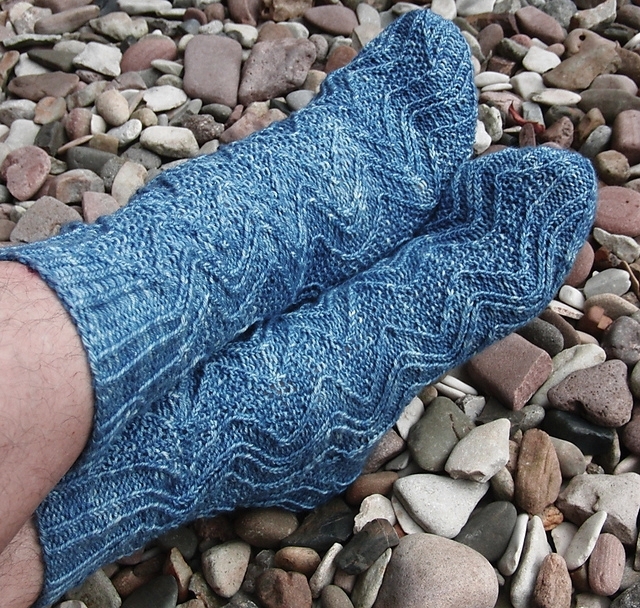 Well, in 2014 we had a 'sock challenge' in the Posh group on Ravelry. The aim was to knit seven pairs of socks from Posh yarns, one for each day of the week, over the course of a year and as by now you know that I love to knit socks, you know that I had to knit along. Such good fun since a challenge like this keeps you going - and today the challenge in addition brought a fantabulous surprise, since there were prizes o win. and today my 'Any Given Thursday Socks' were picked as a winning pair by Tony himself! Happy New Year, everyone! I hope your start into 2015 was as smoothly and nice as was my one and I'm wishing you a year filled with happy moments only and lots of time for your creative hobbies. Did you make any new years resolutions? I stay away from those, since I've learnt that I always break them, so why have any in the first place? There are some things I plan to accomplish, though. With some Ravelry friends I'm doing a 'Sock Challenge'. 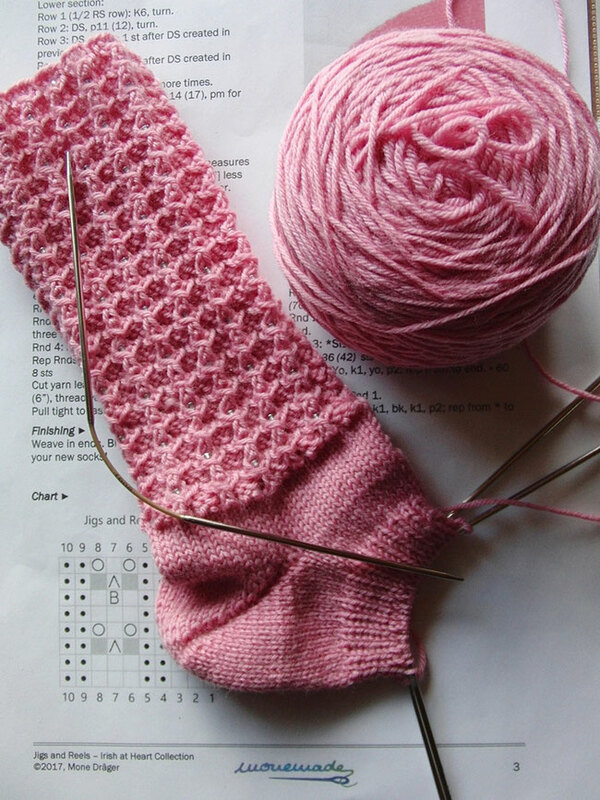 It's all about challenging yourself to knit a certain number of socks in 2015. Well, I know that I'll probably knit lots of socks, but for this particular challenge I decided to stick to the small number of 7 pairs, all of them for DH. For years he had complained that his sock drawer is overflowing but a while ago he told me that he could use a few new pairs. So 7 pairs, one for each day of the week it is and my plan is to knit all of them from the yarns in my stash that are already wound into balls. When I 'caked' them I obviously had plans to knit them up, but then neglected them - and I hope to turn them into something in 2015. 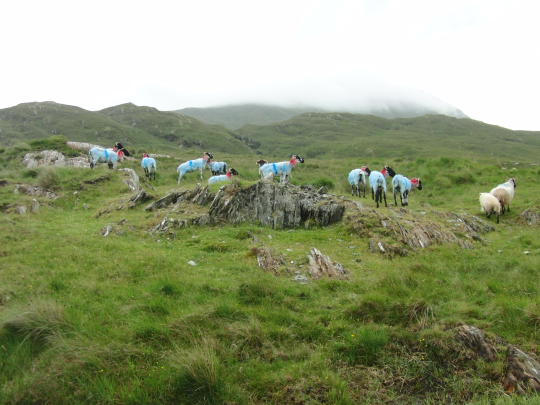 Here are some I spotted at the dip, more than enough for the challenge. And I cast on already... Let's see how I'll do. 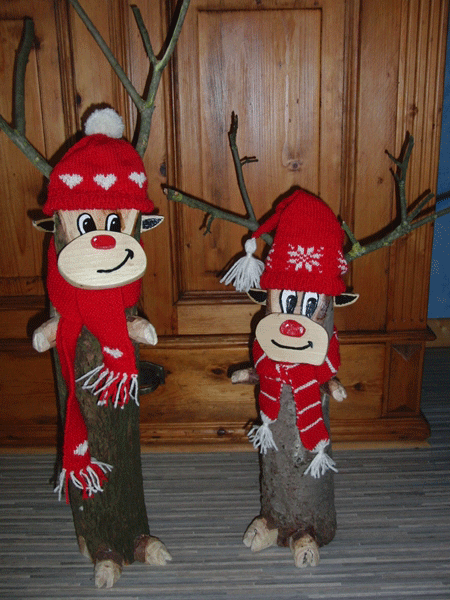 * 'Joint venture': DH made the woodwork, I did the painting and made sure they have warm accessories.